First of all, we know not every BBQ you have is going to be a party but the best BBQ tool sets are also for just family, small gatherings or the best barbecue party in town! If you’re looking to get fully equipped for your BBQ, then you need to make sure you have either a Gas Grill BBQ, Charcoal BBQ or Electric BBQ. Without any of those you won’t be having a BBQ! Next, unless you want your guests to stand or sit uncomfortably on a ledge then we think an outdoor picnic table would be a good investment unless you already have a table and chairs for outdoor use. On the other hand if your grass is nice and mowed then why not sit on the grass with a picnic basket set that’ll include all the cutlery, plates, glasses and some even include a picnic blanket. Sets are made for either 2 or 4 people so if you have a large party you might need more than one set or you can mix and match it with the picnic table. 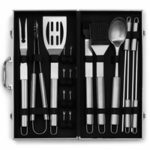 A large BBQ tool set (10 pieces or more) will include most or all the BBQ utensils you’ll need for barbecuing. There may also be a few other useful BBQ tools that can make your chef experience a bit easier, we’ll mention these tools below. 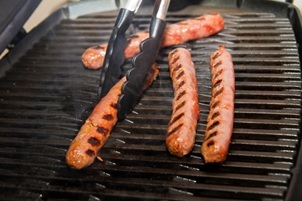 Below we have a list of BBQ tools which most will be included in the best BBQ tool sets. 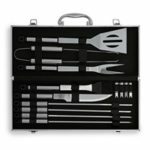 But in case you need more or prefer to mix and match individual tools, we’ll go through each of the BBQ utensils and its function so you can decide whether it’s necessary for you or not. 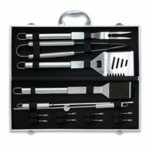 Although barbecue tool sets usually work out to be cheaper and most of them come with a handy carry case too. Essential tool used for flipping burgers, fish fillets or any other meats. This ensures the meat is cooked properly throughout. Don’t do what many people do and press down on top of the meat as this squeezes the juice out which causes the meat to become more dry. It is recommended to use two different spatulas to handle raw meat and cooked meat or veg. Alternatively you can wash the spatula after handling raw meat if you plan to use it to handle cooked meat or veg after. 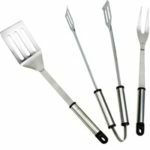 A spatula is included in all of our barbecue tool sets, however if you prefer to buy another one then you can grab one mentioned below, but it works out cheaper as a set. Another essential tool alongside the spatula, tongs should be long enough so you can keep at a safe distance from the BBQ heat. Perfect for flipping or turning over food that the spatula struggles with such as sausages, chicken, and other foods & vegetables. Be careful not to put too much pressure when picking up food as you don’t want to crush it. Once the good is cooked, the tongs will be probably your best utensil of choice to serve the food up on a plate. Can also be used to flip meats but do not piece the meat since you don’t want to risk the meats breaking in half and you don’t want the juice to leak out. 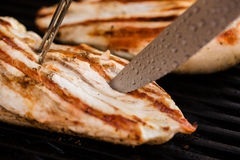 Used best in conjunction with a spatula to flip meats, when the meat is on the spatula, simply use a flat part of the fork to hold the meat still. 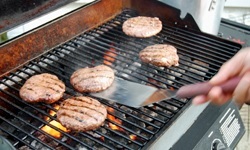 This gives you more control when flipping meat over and reduces the chances of it falling through the grill bars! It’s also used to hold meat still if you need to slice it during preparation. Again, this is included in all of our tool sets, but the BBQ fork below is perfect if you prefer to buy it separately. Ideal for salads or serving certain foods or soup, you probably won’t make as much use out of it if it’s included in the BBQ tool set you want. If you’re someone who will make good use out of it then check out this large BBQ spoon below. Most people will already do their food preparation before they step up to the BBQ plate and most people will also probably have a half decent knife set to cut meats with. Therefore a BBQ knife is not really needed unless you don’t already own a decent knife. Much easier to use when cutting meat or veg as opposed to a kitchen knife. For cutting cooked meat, you can simply hold the meat with the tongs and cut it with the scissors. Also good for cutting open food packaging. A silicone brush can handle heat really well making it a perfect choice. Dip the brush in sauce or oil then apply to food on the grill a few minutes before it’s ready to be served. Since this is really useful to have it’s included in most BBQ sets. Unfortunately, the part we all hate but someone has to do it, cleaning. 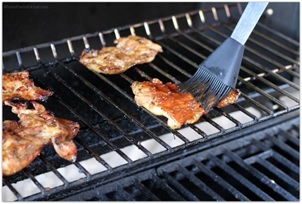 The good news is with a BBQ cleaning brush, it’ll make your life a lot easier! First, if you’re already using a cleaning brush make sure it’s not worn out as it won’t be as effective at doing its job. A split brush head can also leave traces of bristles on your BBQ grill and we’re sure no one would want a nasty surprise. How else are you supposed to cook your meat and veg kebabs!? Keeps your own made kebabs together on the skewer without falling apart. You’d have a tough time turning each item over individually without this. 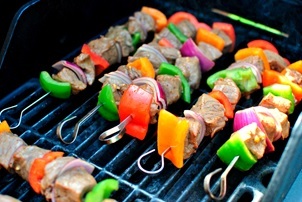 Steel skewers might be a better choice as you can reuse them, they’re also stronger and can hold more meat and veg. 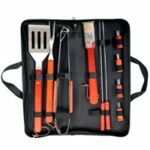 BBQ tool sets probably don’t offer enough skewers if you’re holding a larger BBQ, but you can get an extra set for very cheap. Ever tried eating a corn on cob when it’s come straight off the grill? Well if you have then we’re sure you’d wait until it cools down next time or eat it when it’s hot and delicious with a corn fork. Although, it does have a purpose, it’s not a must have BBQ tool. 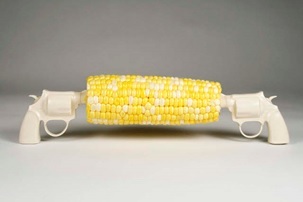 Basic designs like the one below are very cheap but you can get cool funny corn holders for a bit of entertainment. Put inside meat, seafood or veggies, easy to use as it keeps the food together and you don’t need to turn the food over individually. 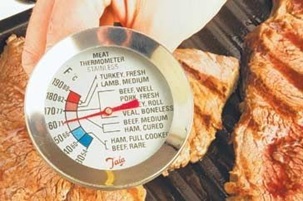 To prevent meat from being under or overcooked, a meat thermometer will be extremely useful. Simply insert it into any cooked meat to get a temperature reading, some thermometers will tell you what temperature certain types of meat should be at. If you were planning on getting a BBQ fork and meat thermometer, then there’s a perfect solution for you called the BBQ Fork Thermometer, which as you’ve probably guessed is a combination of the two.